Latin American scholarships are awarded annually to many teachers across Central and South America, enabling them to attend Suzuki teacher training courses at Festivals. In 2007, teachers and families from the USA, Canada, Scotland, England, Norway and Germany sent contributions to this fund. In addition, the SAA made a generous donation and as a result, 59 international scholarship recipients attended the 23rd International Suzuki Festival held in Lima, Peru, January 2008. These funds go far beyond benefiting individuals. Many thriving Suzuki communities have been created by enthusiastic festival participants. In Peru, where about 50% of the population live in poverty, with half of those living in extreme poverty, our events must be accessible, otherwise they become the privilege of the elite. This fund makes our festival viable and in 2008 allowed us to offer an additional 105 scholarships to Peruvian teacher participants and 93 scholarships to Peruvian children. With your help we have come one step closer to the realization of Dr Suzuki’s dream: a better, safer and more peaceful world through music. 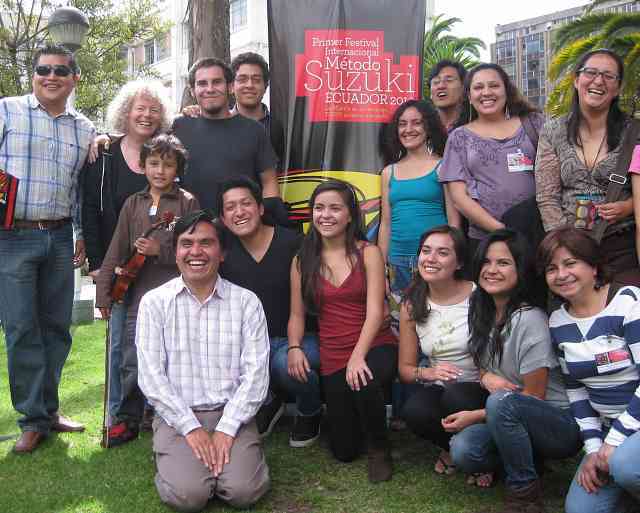 The Suzuki Association of Peru wishes to thank profusely all who have so generously contributed. Muchísimas gracias!